For more information please visit Q&A section. 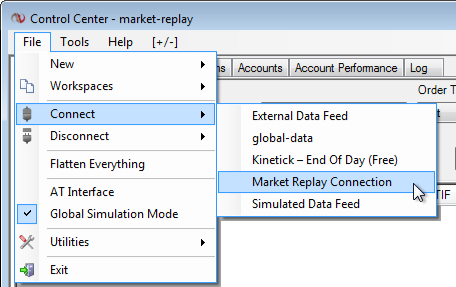 To connect to “Market Replay connection” in NinjaTrader Control Center go to menu item “File->Connect->Market Replay Connection. Please note that you need to disconnect from your data feed first. A Help Guide has a nice video tutorial. Don’t download too much of the data because NinjaTrader Market Replay performance will be slow. Download only necessary set of instruments for the replay session. For example, if a trader has a plan to trade only /ES, a secondary instruments could be considered as /ZB, /YM, /NQ and /TF. However, having /GC and /SI data at the same time is not necessary. MarketReplay has a local cache for all downloaded data, and any subset of data could be retrieved from there. A local cache contains the data in compressed format with compression ratio about 2:1. When data is available in a local cache, the actual download not needed because requested data will be uncompressed and placed into corresponding folders automatically. Use L2 NinjaTrader data only when it is needed (read a note above).